dedicated to the sport of bike racing. who are dedicated to the sport of triathlon, duathlon or running. We created our INTENT teams so that like minded people could train and race together under the support and guidance of our INTENT Coaches. We take managing our teams very seriously and as a result they are organized and effectively managed. Most important is that we are dedicated to welcoming all levels of athletes to our INTENT teams. The internal structure of our teams is designed to support new athletes as they get started and to keep more experienced athletes motivated and inspired. 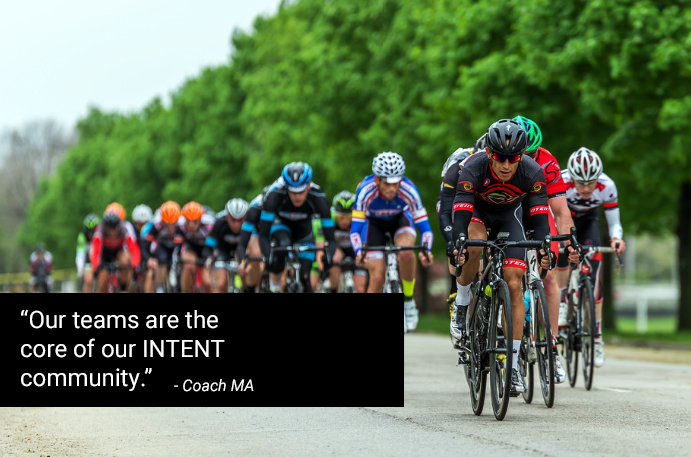 OUR INTENT TEAMS ARE KNOWN THROUGHOUT OUR RACING COMMUNITY AS A GROUP OF GOOD PEOPLE WHO TRAIN AND RACE TO THEIR GREATEST ABILITY WITH GOOD CHARACTER AND GREAT SPORTSMANSHIP.